Stagecoach Newcastle's Enviro hybrids are starting to arrive. Out of the order for 26, so far 12061-8/72 have arrived and they are to be seen parked at the Walkergate depot just east of the city centre. Driver familiarisation is now taking place in advance of the new vehicles being introduced on the 39 and 40 cross-city routes. As usual with an influx of new deliveries, there is great speculation about vehicle cascades and rumours are that the X87 / 88 services will be converted from single decker MAN operation to double deck Enviro 400 operation using Enviro 400 's currently used on the 39 and 40 routes. The new hybrids have arrived much earlier than expected so that could mean the 21 ordered for Sheffield are likely to be delivered soon. 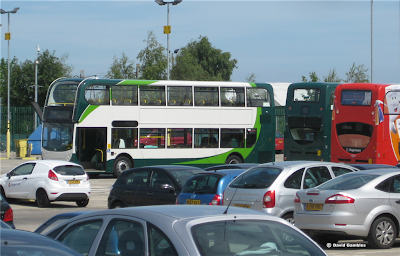 Both the Newcastle and Sheffield vehicles were ordered by Stagecoach following last years Green Bus Funding Awards, when Transport Minister Norman Baker announced that the government would fund the difference in cost between standard buses and the more expensive hybrids.